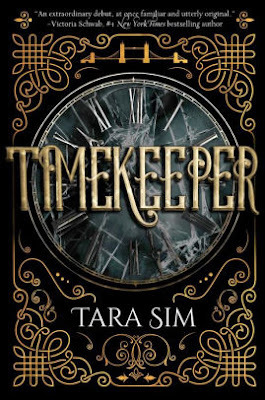 Timekeeper is a YA novel set in England in the late 1800s, with some historical (mostly, inventions, etc) aspects played with by the author for her version of this world: it has a very steampunk feel to it, and this is only added to by the fact that clocks play a huge role in the story. The clock-towers effectively control and guide the towns around them, and our young protagonist, Danny, is a mechanic of these clocks who can feel the threads of time acutely. He is working towards trying to be a major mechanic at a new clock that is being built to try and save a town who became trapped in time after their clock tower was destroyed. One of the people trapped inside was Danny’s father, adding to his emotions on the project. There are also myths surrounding what happened—and the clocks in general—regarding the spirits of the clocks themselves, and I’m sure you can guess that maybe more comes to light about said spirits which causes complications in Danny’s journey. What we have here is an intriguing mystery, adventure, and love-story. The different layers come together nicely, if a little predictably; that is, there are definitely clues left lying around as to what happened in the past and what will happen in the future, which is good for the story coming together, but the clues are maybe a bit bigger than they need to be. I wasn’t super surprised by a lot of what happened, but I still enjoyed the story anyways. The writing itself is clear and direct, which is effective if a little stilted at times with telling the story. I did, however, feel like the little added pieces about different myths of time (not integrated into the main story itself but additional short stories) weren’t per say all necessary, or there could have been a different manner to relay them, as I found myself tuning out at those moments. However, overall Timekeeper was a cute and a fun little read, with some interesting mythology that I haven’t really seen elsewhere before. Apparently this novel is also the first of a series: so the question is, will I keep reading the next instalment? Potentially, if I find I am wanting to read something not super heavy at any point, but there are a few things I want to get into on my to-read list before I dive back in to this world. Honestly, I’m probably a little biased with this one, and writing a review feels a little strange because not only was it written by an old pal of mine from high school but it is also quite a love-hate letter to the city I live (albeit a somewhat fictional one), Edmonton, which doesn’t always get much of a feature in a lot of the things I read or watch (though one of my previous reads this year, Birdie, did include the city as a part of the protagonists’ larger journey). There’s a familiarity to the locations and settings and feelings about living here, but this is indeed a work of fiction with some befuddling logistics, as well as some fantasy thrown in there too. Honestly, this is a bit of a strange book, but definitely hits on some important subjects and is enjoyable, if a little heavy-handed at times. 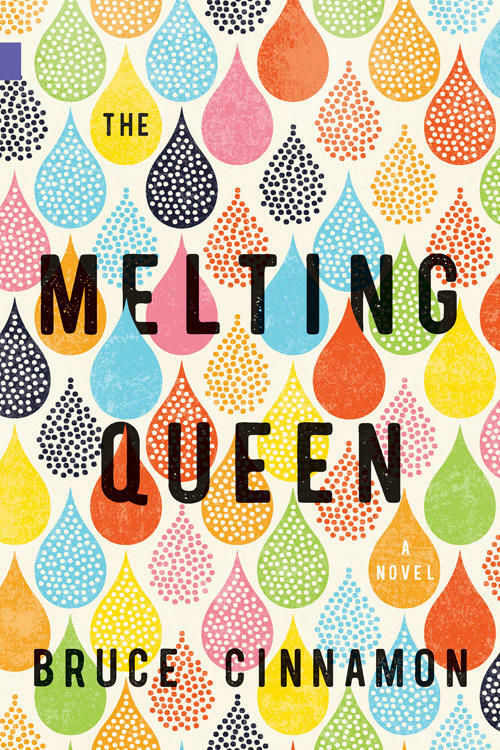 The Melting Queen, follows a young individual who we are introduced to as Adam, who soon comes to reveal to the reader that they are coming to terms with a truer identity, less restricted by gender. This, of course, all occurs right smack in the middle of something bigger, however, which is the Melting Day festival of Edmonton (this is not a real thing, but is a fun idea): the day that the ice on the North Saskatchewan river breaks every year marks a big and inclusive festival for all, as the day signifies the true beginning of spring. Every year on this day, a “Melting Queen” is also named: a woman whom then becomes a symbol of hope and resilience for the year for the city. So what happens when someone who doesn’t quite fit the mold gets chosen? And is this bright, beautiful face of femininity just a farce of a tradition with other truths hidden behind the seemingly perfect veneer? Being that the story of The Melting Queen comes in just a little under 200 pages, there is a lot packed in there thematically: albeit a simple story that doesn’t per say span much time, we deal with the idea of tradition, gender, identity, performative femininity, and the pain and hurt that women will have inflicted upon them only to be later disposed of and forgotten (or expected to forgive the wrong that was done, all with a smile ever-present on the face). As I mentioned before, some of this can come across in a pretty heavy-handed and explanatory way, which doesn’t seem entirely authentic at times, but there is enough intrinsic exploration to temper this out a bit. It is also a little heavy on the “I hate my city” front, and I mean, I get why a lot of people don’t like it here, but I also get why a lot of people do: same thing with all the different areas of the city mentioned and festivals, etc, I wonder if someone who isn’t as familiar with Edmonton will really understand a lot of things here (the locations, the events, the history, the feelings, the general attitudes) intrinsically the same way that someone who lives here will. But who knows, I might be romanticizing. In any case, The Melting Queen is an intriguing book, and very different: a little shaky at times, but I enjoyed it nonetheless. It isn’t overly long for the story it is telling, and I think that works in it’s favor despite having so much included, as it may have gone even more into the explanatory dialogue in order to fill in the blanks. I also enjoyed how at the end, there is a list of all the Melting Queens from this fictional story, though a number of real women who made an impact on Edmonton’s history are included and honored; it is a nice little nod to those who we may not remember, despite making a mark on the city that we still feel the effects of today. This book had all the ingredients to be very interesting, and it almost got there: almost. Unfortunately, after sludging through a pretty slow first-half which didn’t engage me very much, it drew me back in with some interesting twists, only to then fizzle out again. The whole thing just left me feeling cold, a large part of which I think had to do with how impenetrable I found the protagonist, Nella: I felt like she was being kept at an arms length and just couldn’t crack her. 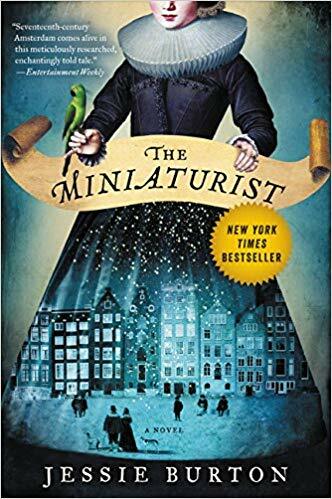 The Miniaturist follows a young woman in 17th century Amsterdam named Petronella (or Nella): she has moved from the countryside to live with her new husband Johannes, his sister Marin, and their two house workers. Nella’s marriage was essentially arranged by her mother and Johannes’ family, and as Nella comes to live with them she finds herself living quite a lonely existence as Marin and Johannes’ main priority is the family’s mercantile business. This is, however, until Nella employs the work of a miniaturist to fill her new gift of a small house, only to find that the mysterious worker seems to know all about Nella’s household and its secrets before she is even aware of them. Along with their business issues, other dramas and juicy secrets in a very strict time threaten to come to the surface and create vast change in the lives of this family. The setting of this novel and how the strict religious observance and laws impacted the lives of the characters is set up with a lot of potential, but I feel like it always ends up just falling short. Furthermore, the drama and secrets, while twists, do seem a little spot-on and exactly what you’d expect from a story like this set in a time like this. I was beginning to be drawn in by the different story threads being woven, but ultimately found some of them being wrapped up or forgotten in a hasty manner. There was so much to explore and while the bones of an engaging story are there, I never felt much for any of the characters and the conclusion didn’t stir me all that much either. Was there ever an actual explanation for some of the more fantastical-seeming things that occurred? Did I really believe some of the characters motivations and relationships as they were revealed? Honestly, it’s a big shrug. I guess I would say The Miniaturist just left me feeling kind of ambivalent: it almost grabbed me at some points but never got to me in the end. Canadian artist and pop-culture aficionado. 1D af.